FOSSCON 2019 is approaching, and we now have a venue and date for you! This year FOSSCON will return to International House Philadelphia for a full day of talks, workshops, and networking on Saturday August 17th. We look forward to seeing you there! FOSSCON is a Free and Open Source software conference held annually in Philadelphia PA.
FOSSCON brings together users of Free and Open Source Software from a wide variety of fields. Our attendees include students, systems and network administrators, developers, executives, and more. 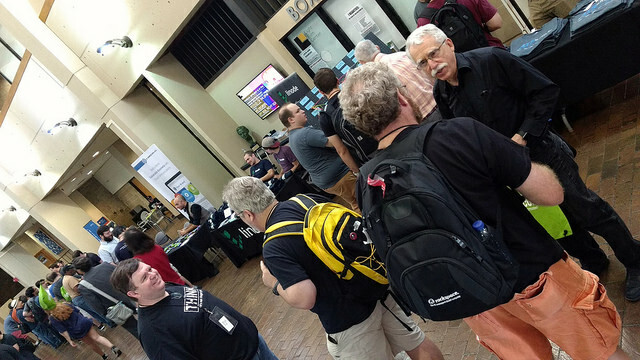 Attendees come from around the world to participate in talks, learn of new technologies, and visit sponsors and FOSS projects represented in our exhibit area. Staying immersed in the local Philadelphia area has given us the opportunity to build relationships with the community at large, which in turn creates loyal supporters and attendees each and every year. Our continued growth from a meager start at 50 attendees to our current average of several hundred, coupled with our desire to enrich and educate the community is the biggest reason our event continues to progress in all areas. FOSSCON is run by a solid team of volunteers who dedicate time year-round to develop this ongoing event. Every person gives their time and resources to maintain, plan, build, and reach out so that we can continue to offer a better event each year. We would not exist if it were not for these dedicated individuals and their commitment to our mission. If you have interest in joining our team, please email our director (Jonathan Simpson - jsimpson@fosscon.us ).